A ruby is a pink to blood-red gemstone, a variety of the mineral corundum (aluminium oxide). The red color is caused mainly by the presence of the element chromium. Rubies have a hardness of 9.0 on the Mohs scale of mineral hardness. 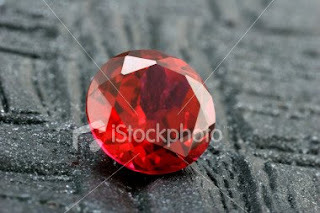 The finest ruby is best described as being a vivid medium-dark toned red. Secondary hues add an additional complication. Pink, orange, and purple are the normal secondary hues in ruby. Of the three, purple is preferred because, firstly, the purple reinforces the red making it appear richer. Secondly, purple occupies a position on the color wheel halfway between red and blue. In Burma where the term pigeon blood originated, rubies are set in pure gold. Pure gold is, itself a highly saturated yellow. Set a purplish-red ruby in yellow and the yellow neutralizes its compliment blue leaving the stone appearing to be pure red in the setting. The most common treatment is the application of heat. Most, if not all, rubies at the lower end of the market are heat treated on the rough stones to improve color, remove purple tinge, blue patches and silk. These heat treatments typically occur around temperatures of 1800 °C (3300 °F). Some rubies undergo a process of low tube heat, when the stone is heated over charcoal of a temperature of about 1300 °C (2400 °F) for 20 to 30 minutes. The silk is only partially broken as the color is improved.